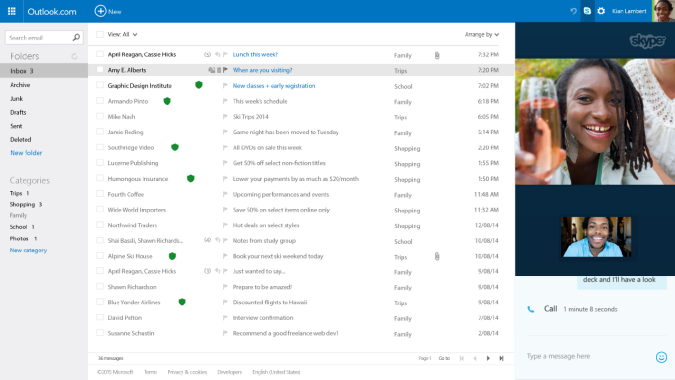 A couple of weeks ago, Microsoft rolled out a ton of new features for Outlook.com – including heavy integration with Skype. While this update was only available to a small batch of preview users, the changes are now rolling out to everyone on the email client. Now when you click on the Skype Icon on the sidebar you can see which friends are online, view recent conversations or search for contacts. You can start a chat by clicking on the avatar bubble on the right side, and as you’d expect, your messages are synced across devices. Given the popularity of Hangouts among Gmail users, it makes sense for Microsoft to leverage its own chat platform and allow users to have a quick way to chat while checking their emails.